For the Christmas holidays we decided to visit a state we have never been to and didn’t know much about. So we chose Madhya Pradesh in central India. Sure enough, some of our foreign friends had never heard of it and our Indian friends asked us what there was to see in MP. Madhya Pradesh actually has a lot of interesting historical and natural tourist sites. It is also the second biggest state in India. Of course we could not see all of it so we decided to visit only the western part including Indore, Maheshwar, Omkareshwar, Mandu. I had read about the bad roads but obviously the information I had was out of date because a new highway took us from Indore to Maheshwar in less than two hours. I’m glad I had the chance to visit Maheshwar because it is one of my favourite places in India. 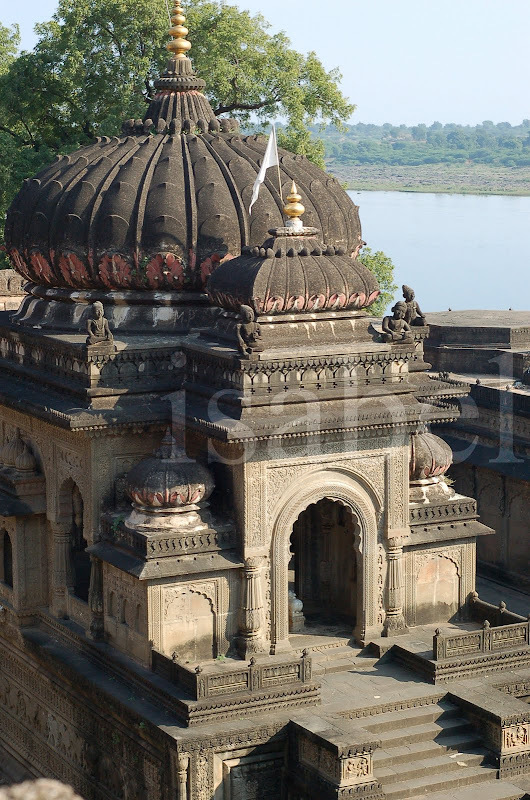 The town is dominated by the Ahilya Fort and adjoining Ahilyeshwar Temple which are directly on the banks of the Narmada, one of India’s sacred rivers. Looking down from Ahilya Fort, I found the view both breathtaking and fascinating. The riverfront was a flurry of activity at all hours of the day. I spent most of my time either observing the scene from the Fort or sitting or strolling on the ghats by the riverfront. As the sun rose over the Narmada each morning, people would already be on the ghats offering their prayers and flower garlands to the sacred river. Men paced up and down the length of the ghats reciting ‘Om Namah Shivaya’. The mornings were a little chilly but this did not deter the faithful from taking a holy dip in the river. They cupped the sacred water in their hands while reciting prayers in Sanskrit and then carefully poured the water over their heads, and even into their mouths! Others were busy lighting incense and garlanding the numerous small shines dedicated to Shiva, represented by a Shiva linga and a small statue of Nandi the bull. Meanwhile, the women and girls would be busy doing their laundry. The ghats echoed with the beating sound made by the wooden bats (which looked like small cricket bats) they used to pound their clothes clean. They would then dry their saris by laying them flat on the stone ground to dry in the hot sun. Or a woman would hold each end of the sari and it would dry by fluttering in the breeze. By mid-morning these peaceful morning rituals would be interrupted by the loud sound of the sputtering engines of the numerous colourful tourist boats. There were many tourists and pilgrims who would come to visit the temple and take a trip on the Narmada or have a swim. There were few foreigners around so we were also a curiosity. Everyone wanted to ask us from which ‘village’ we came from and take their picture with us. On Christmas Day, many random strangers wished us a ‘Merry Christmas’! At sunset, the sputtering engines of the tourist boats would finally stop and the faithful would be back for the evening puja. Once again all the small shrines would be carefully decorated with flowers and incense and the sing-song of prayers would be heard all along the ghats. As darkness quickly fell, prayers and flowers were offered to the sacred river, followed by the lighting of small oil lamps which were floated on her waters. Back up at the Fort, I witnessed the spectacular sight of hundreds of lamps slowly floating down the dark waters of the Narmada. A sight I will not soon forget! 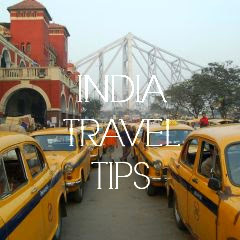 I have been reading your blog for a while now and I am impressed with your impressions of India. The ghats look as clean as when we did so many years ago and I hope Maheshwar is not littered with plastic bags and bottles as so many tourist sites are. It breaks my heart every time I visit India. That being said, did you get a chance to visit the Maheshwari saree looms? Also, I would love to hear your impression of Indore since that is where my whole extended family has been living for the past five generations. Keep writing about India outside your window. I am really enjoying your blog. I love all the big pictures and your sections on (Take a walk through ..." "Listen..." and "Watch..."
It is obviously a labour of love, and yes, I also love India. Thanks for the comment on my blog. I would be happy to have a link toy uor blog on my site; and would love it if you would put a link to mine on yours. I will be in India soon (leaving Canada next week) for three months. Maybe we can meet up! I will be in Bangalore in early Feb. (still need accommodation). The rest of my itinerary is on my blog. Jaya: Thanks for sharing your memories! Yes, the ghats are quite clean - I didn't really think of that but you're right. Yes, I did visit the weaver's collective. I will be posting more on my trip to MP - stay tuned! Mariellen: I have added a link to your blog. I look forward to meeting you in Bangalore. I belong to Madhya Pradesh.Very beautifully you have written about Maheswar and very nice pictures. Congratulations! 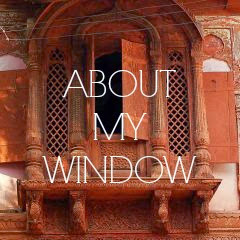 Some day visit my blog,in case you have more interest to know about Indian traditions and Hinduism. Thanks for dropping by at Rang Decor. You have a delightful blog here. Though not from M.P I am glad that this state's tourism is slowly gaining prominence. 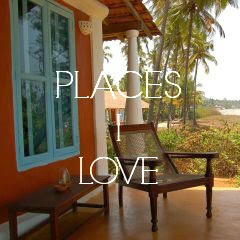 Some of India's best kept secrets are here. I recalled my trip to Maheshwar.The Ghats look lovely from the river and the intricate sculptures inside the temple are simply stunning. I am glad that you got to see the Maheshwari cotton looms as well - delightfully colourful & surprising soft material aren't they? Yesterday ( 7th Nov) I was at maheshwar enjoying the beauty of narmada and the Shiva temple and the intricate carvings, the ghats and it was a divine experience! Luckily Muslims have probably not reached there in 17th and 18th century to destroy the carvings, trunks of elephants etc and they still are intact as if made recently.